Devastating Koenigsegg Crash At The Nurburgring! 1 Down, Only 6 Remain! Possibly The Ring’s Most Expensive Crash! - Muscle Cars Zone! Devastating Koenigsegg Crash At The Nurburgring! 1 Down, Only 6 Remain! Possibly The Ring’s Most Expensive Crash! The Nurburgring is definitely no stranger to massive crashes. However, occasionally the Green Hell manages to take an exceptionally rare vehicle! At July 18th, the very special Koenigsegg: One 1 made the huge sacrifice! We are talking about one very rare 1,341 HP Koenigsegg One:1 hypercar! This Koenigsegg crash may be the ring`s most expensive ever! Koenigsegg announced that the crash occurred during the Pool track testing. The automaker was working on car development and making preparations for a probable record lap at the glorious track! Fortunately, from this devastating Koenigsegg Crash, the driver escaped with only minor injuries! The automaker reportedly said that he was released from the hospital right away! 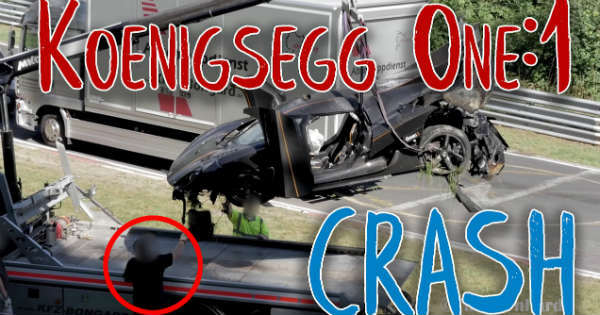 The Swedish automaker didn`t gave a specific reason for this huge Koenigsegg crash. The manufacturer just said that they always aim to be safe to the utmost extent. However, they also said that with high-performance testing prototypes the risk for a catastrophic crash always exists! A photographer working for MotorAuthority reportedly said that the Koenigsegg One:1 entered the corner way too fast and wasn`t able to slow down enough in order to avoid hitting the barrier! In the footage below, you`ll be able to see the tire tracks leading up to where the crash occurred. The long tire tracks may indicate towards a mechanical issue, possibly an ABS related problem! When you look at Koenigsegg`s Nurburgring history, they didn`t have much luck. In 2014, one of the automaker`s Agera prototypes crashed there as well! However, the Koenigsegg One:1 is way more expensive and rarer than the Agera! Including a prototype, just seven of these beasts were built! The original price tag of the One:1 is estimated at $3.1 million! Meaning that this Koenigsegg Crash (if we don`t consider motorsport series like F1) is the most expensive ever! MotorAuthority reports that Koenigsegg aim to rebuild the destroyed One:1! We would be very happy to see it up and running again since there are only 6 of these beasts remaining!